It appears to me that the white, or normal, Storylets that aren't part of an event or longer story are infinitely repeatable. As I level up my Qualities, I have been unlocking more, but have not been moving on to these higher-level tasks because I have been collecting the rewards from the lower-level ones. I'm now tempted to switch to the new Storylets that I've been neglecting, for higher Quality gains and to break up the grind. However, I'm concerned that if I gain too many levels in the associated Quality, the old Storylets will start to become trivial and fall off. 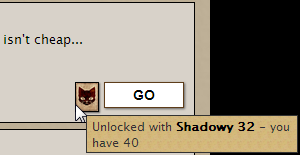 Will I be able to keep my easy source of items if I continue to progress? No, any white (regular) Storylets that you are eligible for shouldn't disappear, but you may eventually become ineligible for them. Like you've said, while Storylets of other colours may disappear after they are completed, white Storylets normally don't. All Storylets that the player is eligible for in a given location are always available. Now, what may eventually happen is that you find yourself ineligible for old Storylets. While most Storylets have a minimum Quality level requirement, some have a maximum level requirement. If your Qualities exceed a maximum level requirement, the Storylet will be locked. What can be even more confusing, however, is that while some Storylets may have maximum Quality requirements, they aren't explicitly told to you. I've only really seen this happen with Storylets that take place in Veilgarden, Ladybones Road, Spite, and Watchmaker's Hill and only with Storylets that just require one of the four major Qualities (although I can't be 100% sure). While some might find this annoying, it seems to be done as an effort to keep these locations from becoming cluttered with Storylets that are largely irrelevant to higher level players. Storylets appear and disappear based on your current Qualities, as affected by your equipment. 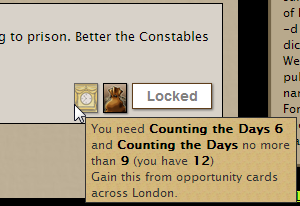 If you pick up a Talkative Rattus Faber (-25 to all stats) from the Bazaar tab, you'll suddenly see several old storylets appear again. Similarly, equipment that improves your Qualities will unlock higher storylets. If you disqualify yourself for an Opportunity Card, the result is a little odd; nothing will happen if you click on the card (the page will refresh, but with nothing new on it). The card's the hover text will include something like "unlocked with Watchful 25 and Watchful no more than 50" if you have 51 Watchful at the moment. You can discard the card, or you can shuffle your equipment around until you qualify for the card again if you want to play it. What is the difference between yellow and white unlocked Storylets?